This stunning villa is situated in an enviable position just yards from the prestigious beach at Vlicha Bay, Lindos. Cleverly designed and built to a high standard, this lovely villa offers air-conditioning throughout, three double sized bedrooms, two bathrooms and its own private 8X4m overflow swimming pool. Complete with a large garden, extensive decking area with ample sun beds and parasols and a stunning view. The letting of Villa Neos is a part of our family businesses. We are well accustomed to the hospitality industry whilst operating a 5 star/gold award bed and breakfast business. We also have a further rental property in Wales and more recently we have expanded the use of our land for glamorous camping in Mongolian Yurts! In each of our investments we have set our standards in quality of accommodation very high. Villa Neos was chosen not only because of its fantastic location, virtually on the beach and with a few minutes drive from the centre of Lindos, but also we could have some say in its construction. Lindos is almost certainly the most popular destination on Rhodes and whether visitors are experiencing the area for the first time or not the appeal will never diminish. The strong points of the villa include the stunning views and its location. The furniture, beds and bedding, appliances, entertainment equipment and the overall finish is to a high standard. Nothing spoils the feel of a property more than providing poor quality furnishings and utensils! We have set our standards high to hopefully please all our guests. Bathroom 1 full suite with bath/shower located on the first floor. Bathroom 2 full suite with a shower and is located on the ground floor. Heating via air conditioning units. Ample private parking for 2 to 3 vehicles. Complimentary fibre broadband. Password provided. Fully equipped kitchen with cooker, hob, extractor, fridge/freezer, washing machine, dishwasher, coffee maker, microwave oven, etc. Alien satellite system connected to Internet. X Box 360 console and games. Large private garden with plants. Extensive decking area with built in parasols. Further covered pergola with views to sea. Patio doors lead on to balcony on both first floor bedrooms. Verandah on ground floor bedroom. The nearest golf course is approximately 20kms from the villa. There is a ground floor bedroom and ground floor bathroom. This may be helpful for guests who are infirm and cannot manage stairs. Notes on accommodation: The cost of electricity for air-conditioning is included in the rental price. Outside: The substantial garden has ample patio areas with sun loungers and seating for 6 people. The private overflow pool is 8m x 4m and is for exclusive use by the guests of the villa. Utility Room: Utility area includes washing machine, ironing board etc. Cleaning / Towels / Linen / Maid service: Linen and towels (not beach towels) are included. The linen change will take place once a week. Other: The dining area has seating for 6 people. As a family of 4 with a 27month grandaughter we had a fantastic week stay at the beginning of October. 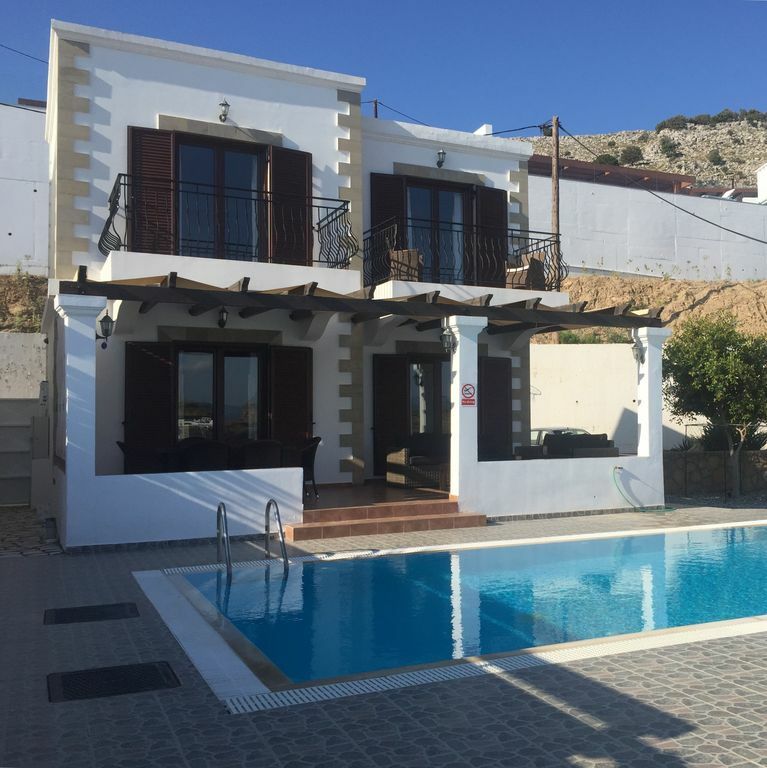 The villa suited our needs, it was clean & tidy with ample room in an excellent location with fantastic views, together with a good sized pool. As we arrived late it was nice to receive a small welcome pack. We hired a car making it easier to travel to Lindos & Lardos for excellent meals and the sandy beach at Pefkos which was child friendly, together with the airport journey. Dave the pool man was very friendly with restaurant tips in Lardos. We would recommend it to family and friends, although not to disabled people as the steep climb to the villa was tough going. We had a fantastic holiday at Villa Neos which sits up on the hillside with spectacular views over the bay. Location is near to Lindos but car hire recommended to make everything that little bit easier in terms of getting out and about. Would highly recommend this villa to others. Many thanks for your comments and I’m so pleased you enjoyed the villa. I hope you find time to return for another well earned holiday! We really liked this villa, it is spacious with great outdoor space and spacious parking. The views are amazing and the pool really lovely. The villa has all you'd need, we didn't cook but more than adequate facilities should you want to and 2 good bathrooms. A very short walk (3mins) down the hill there is a lovely restaurant, Azurro which is really friendly and serves generous portions, traditional Greek, pizza and pasta. They also do takeaways should you want that. There is also a mini market just near to that with most things you'd need. A couple of evenings we had a leisurely stroll down along the beach and just past the Sensimar hotel there's a taxi rank we then used to get a taxi to Lindos (€9), about a 10 minute walk in total, easy to get a taxi back (same price) and we just asked for the Lindian Jewel (hotel attached to Azurro), and walked the last 2 minutes up the last bit of the hill. The villa itself is in a perfect location for exploring the area and visiting Lindos or quiet lazy days round the pool. Would highly recommend this villa, we were 4 adults in our mid 40s and 50s but can see it being perfect for families with children too. A short section of the hill is quite steep but its manageable and good exercise. All in all a really lovely villa. Many thanks for your comments and I'm really pleased you enjoyed the villa and the area. Very impressed with the villa, great location, stunning views. Delivered on promises and more. Any glitches which were experienced (not through any issues from the villa itself) were acted on and sorted by the management company too! extremely satisfied with accommodation and our stay. Many thanks for your comments and I'm really pleased you enjoyed the villa! Because of the fantastic location beside the sea this lovely villa may appeal to guests whose interests are diving, fishing or water sports. Villa Neos is virtually on the beach, approximately 250 metres away. The lovely beach of Vlicha Bay has a blue flag award and the water is crystal clear. The airport for Rhodes is called Diagoras and is near to Rhodes town. This is around 45kms from the villa to the airport. Rhodes town has a ferry port for crossings to neighbouring Greek Islands, Turkey and further afield. There are facilities within walking distance of the villa, however, car hire is recommended to get the best from your holiday. Vlicha Beach is just 250 metres from the villa. The lovely old town of Lindos is 1km and this has a wealth of places to eat and things to do and see. The ancient Lindos Acropolis dominates the town. On Vlicha Beach guests will have the opportunity to hire water sports equipment, including jet skis, canoes, inflatable rides and boats. There is a wealth of beach sunbeds and rush umbrellas. Around the bay there are several restaurants and mini markets which will cater for most needs. A larger supermarket is less than 1km, and Lindos town (approx 2.5km) is an excellent centre for shops, banks, restaurants and bars. Booking Notes: A deposit of 25% of the value is required immediately after the reservation is made. The final balance will be payable 8 weeks prior to the holiday date. A refundable 'breakage' deposit of £200 is also required to be paid when the final payment is due. Please enquire about the terms and conditions. Changeover Day: Changeover days are on Wednesday and Saturday. Arrival times are generally after 3pm and the villa is to be vacated by 10.30am on the day of departure.